To parboil the potatoes, put them into a small pot, cover with 2 inches of salted water and bring to a boil. Reduce the heat and simmer until the potatoes are just tender, but not completely cooked through since you’ll finish them on the grill. If using bamboo skewers, soak them in water for 2 hours prior to using to reduce charring. Parboil potatoes until done but still firm. 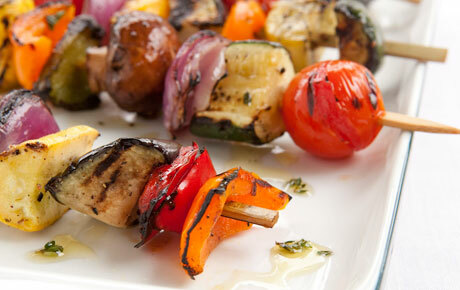 Thread vegetables alternately on skewers. Brush generously with salad dressing. Grill for 3 minutes; turn vegetables over, brushing with extra salad dress. Grill for another 3 to 4 minutes until done. 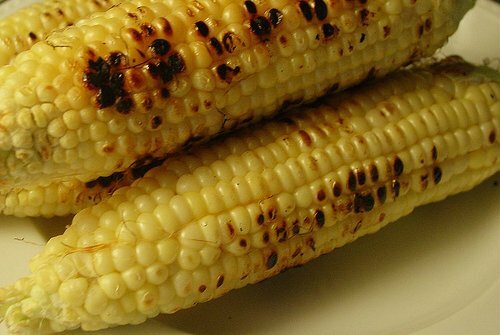 We found this AMAZING recipe for corn on the cob. The best corn I’ve had. Reminds me of the ones they sell on the street in the middle east. 1. Carefully peel back husks of corn. Make sure they stay intact and connected to the corn itself. 2. Remove the silk underneath the husk. 3. Put the corn and the husks back together again. 4. Soak the corn in a bowl of cool water for 1 hour. 5. Barbeque for 8 minutes on each side. 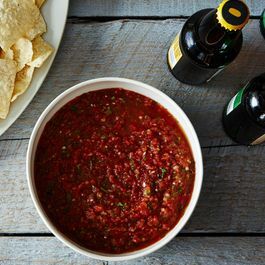 Enjoy this at your next summer barbeque.